Interesting and enlightening article :) I must confess that I am one of the people who overburdens the view controller like you pointed out. Most of the tutorials that I looked at when I began iOS development used that method and so I went with it without pausing to think about it. But I see the reasonableness of your arguments and am looking forward to the rest of the articles in the series so that I can see how you go about this from beginning to end. Food for thought. I agree on some points (Core Data absolutely does not belong in a VC class. 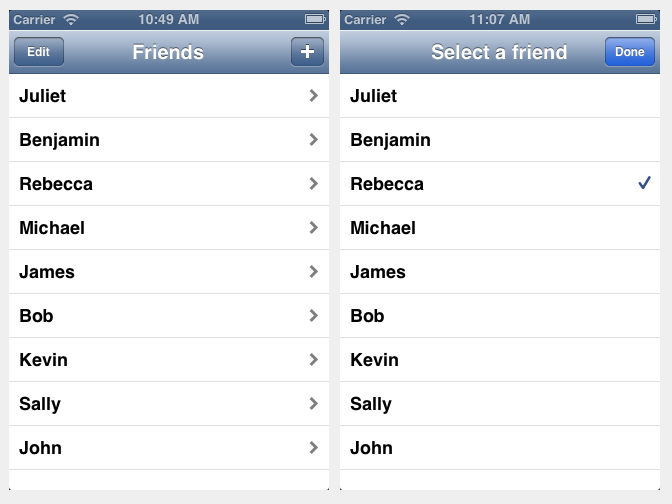 Storing globals in the App Delegate - punishable by death) but Apple is clearly pushing a design that you don't like. Whether or not you agree with it, it's the way it is. If you build your own road, nobody but you will be able to work on your iOS projects because it will be incomprehensible to anyone schooled in The Apple Way. To paraphrase Douglas Adams, if it's wrong, at least it's definitively wrong. 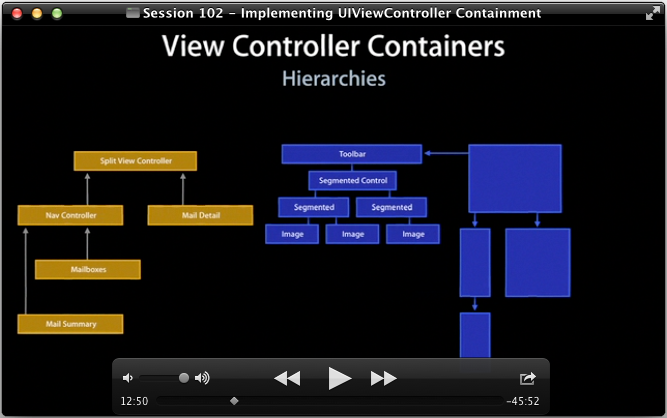 For what it's worth, I find the concept of view controller code reuse to be completely overrated. How often have you been able to reuse code without any modifications? How often have you wanted to? @jsd The kind of thing I've been doing doesn't actually depart from "The Apple Way" that much. 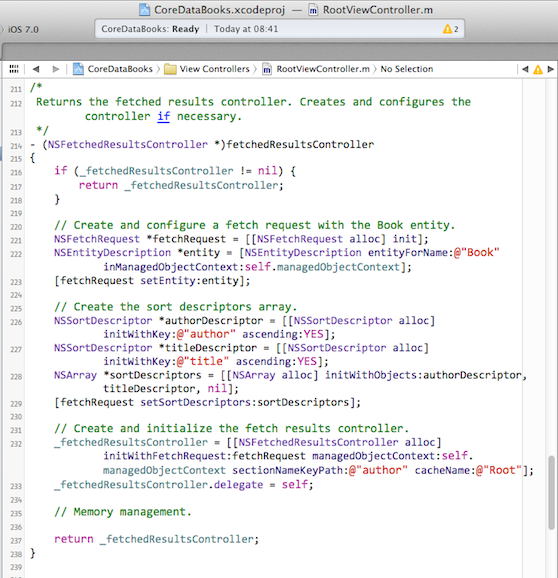 There are still views and view controllers, we just move some logic into real controller objects (NSObject subclasses) which can be unit tested without pulling in entire UI frameworks and requiring an iOS simulator to run. As for view controller reuse, I think it depends on the kind of work one does. Doing Contract/Agency work, we have a huge number of projects and there are always things we can reuse between projects. This may not be relevant to others. I agree with most of your points, but I don't see a sane way out. I wrote an iPhone application for some friends and am very happy with it. I have been going crazy trying to convert it to an universal application. The interface that seems most natural to the end-user has a search bar, dynamic table and webview on the same screen (not to mention a custom button bar at the top). How do you let each of these components update the others? The architecture that Apple presents, ends up with a mess of cross messaging. Everything got hopelessly coupled. I'm very much looking forward to see how you clean up the ViewControllers. Bill, you should be able to do it without cross messaging if you implement proper MVC separation. In this case, the model is application state rather than traditional user data. The way I do it is with an ApplicationState singleton (you can make this a normal object that is pushed into all the view controllers if you are opposed to singletons on philosophical grounds). Usually you just need a bunch of state properties. Using KVO your view controllers can respond to changes in the app state without having to wire them all up as delegates of each other. 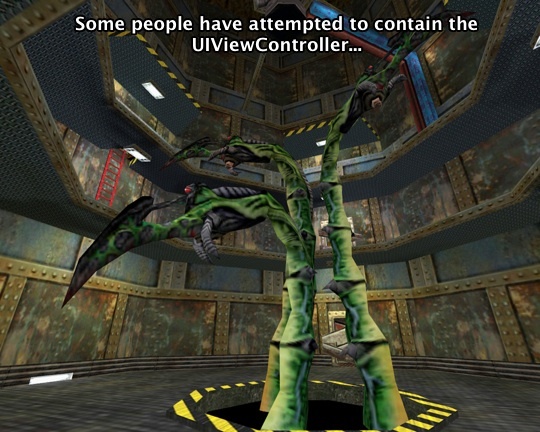 This decouples the view controllers from each other and makes it trivial to add new ones. The other bonus is you can make your ApplicationState class save itself on any state change, and restore when the app restarts. Makes it a lot easier to remember user preferences and is much cleaner than just jamming everything into NSUserDefaults (although you could do that behind the scenes). So let's say I have button that changes the sort order of a tableview. All I have to do is something like [[ApplicationState sharedState] setSortMode:AppSortModeByAuthor] from the button view, and the tableview's controller which is observing sortMode gets the message via KVO. It can then re-sort its rows and reloadData. @jsd I actually considered something along those lines a couple of times. I'm going to first try NSNotificationCenter. If the GUI response times are poor, then I will implement a singleton with global state and probably KVO. My data model is fairly well developed and only needed a few changes for the iPad. But I spent a lot of time trying to follow Apple's SplitView controller approach to migrating iPhone apps to the iPad - doesn't work for me. The good news is that I have something that works; just ugly dependencies everywhere and too many differences between the "controllers" for iPhone and iPad. Thanks for the useful suggestions. It's so frustrating hearing from fellow iOS developers the phrase "I usually don't Unit Test my UIViewControllers, it's just too much effort" over and over again while them keeping 300+ lines of untested code in these classes. We need a way out of this mess! Motivated by Uncle Bob Martin and his great book "Clean Code", I've increasingly looked into clean ways to decouple business logic and UIViewController business. @Mike Weller: You're looking for a job in London, you wrote. Incidentally I've read about a job offer in London today - no idea if there still is an open position, as the blog post was from March. "One can merge the MVC roles played by an object, making an object, for example, fulfill both the controller and view roles—in which case, it would be called a view controller. In the same way, you can also have model-controller objects. For some applications, combining roles like this is an acceptable design." Cocoa for OSX has bindings which allow to tie a model to a view and thus encourages better separation of the model from the controller. Searching for an alternative in the iOS world, I came across BlocksKit. One of its categories, NSObject(BlockObservation), could potentially result in a much thinner controller which observes its model and notifies its view. PLEASE hurry and write the next post. Sorry guys. I start a new job back in London in a month, so things are a little hectic at the moment. I will try and find the time to finish the next post in the coming weeks. You did an outstanding job expressing the flaws in the UIViewController madness that I'd always felt but couldn't properly articulate. Please tell me if you'll publish the next post about this problem? Great article. I am somewhat new to iOS so I wasn't sure if my apprehension about the "view controllers do everything" pattern was just a matter of me not fully drinking the Kool-Aid. Good to hear I'm not the only one looking for a better way. Looking forward to the follow-up article. Interesting stuff! Please release the next post soon! Hey! Great article. I've been thinkin the same way for 2 years of my iOS developer practice. What about next part? and realized part 2 has yet to come. Really anticipating the follow up! Very nice post. Looking forward for the follow-up article. This post is a mind blow, please add some comment to briefly explain how to solve this. I think it would be very useful to many many developers out there. Thanks a lot, changes my way to implement VC. Where is the second part, we want it! Coming from the java world, I always thought there was a bit of a problem with this. Never thought it was great in terms of separation of concern. I'm just facing problem regarding the others who have been taught the "messy" way. I'm trying to be an evangelist but it's not an easy one. Carry on the good work. Loved your post. But I too am anxious to see this explained more fully. However, I would certainly settle for a sample project using tables, data, business logic- simple, but with enough code to see how it's done. Do you have a sample project? Or could you whip one up fairly quickly as a show and tell? Would be pretty cool to see this in action. "So where should this navigation logic go? Well… somewhere else. We’ll get into that in a later post. All that matters for now is that the view controller should delegate UI actions like this to somebody at a higher level, who has access to and knowledge of the specifics of your app’s UI workflow." When is the next post due to come out? Really eager to gain some insight into the "right way"! After six month, where is the next post? I also would like to see a modest app done the right way. I would like to see a modest app done this way, too. However, I would say that it would have to have at least 3 different screens, and perhaps some network access as well. A tableview would be nice. Maybe something like the BrowseOverflow app done in Test Driven iOS Development. Too many of these examples have only the one screen, and so they really fall flat on demonstrating that they're usable for more complex apps. OK, sounds good. I totally agree. We're all awaiting the next post! You can't just leave us hanging, makes me wonder if you have any valid answers to your valid questions, or are just blowing off steam! Come on, next post or fess up that you have no answers! we have some world class mobile experts. if you wanna develop your iOS Apps, please visit http://www.taoteapps.com, By visiting the website you can develop your iOS Apps. I think you see all these problems because most people (including you) have fundamentally misunderstood what MVC means in the Apple world. I recommend reading "MVC as a Compound Design Pattern" in the Apple documentation to clear up how Cocoa MVC is different from classical MVC. "Controllers are supposed to be nice thin objects funnelling data and events between the model and the view. They shouldn’t contain details of a specific UI framework. iOS’ View controllers are nothing like this. They sit firmly in the presentation layer." But this is wrong. Cocoa Controllers ARE supposed to know the details of a specific UI framework. In fact that is the whole point of a view controller. The philosophy of Cocoa is that you are supposed to be able to buy an UIView and a Model object from two different vendors who have nothing to do with each other. In other words model and view objects are supposed to be completely reusable. But somehow you need to make both of these classes who know nothing about each other talk to each other. You need some glue. This glue needs to know about both the model and and the view. This glue is the controller. The UIViewController is not a reusable component. The fact that you write so much about the inability to reuse UIViewController if you do this or that, indicates that you have missed this important part of Cocoa design philosophy. Controllers is where you dump all your non reusable, application specific code. But this does not mean that you need to make every UIViewController a huge bloated mess. You should split it into multiple controllers. A controller can be made up of multiple controllers. Your business logic should be moved into model classes. If you got a table view create a specific controller just for implementing the DataSource protocol. I think the real problem here is that a lot of people have only ever done iOS development and UIViewController is pretty nifty. 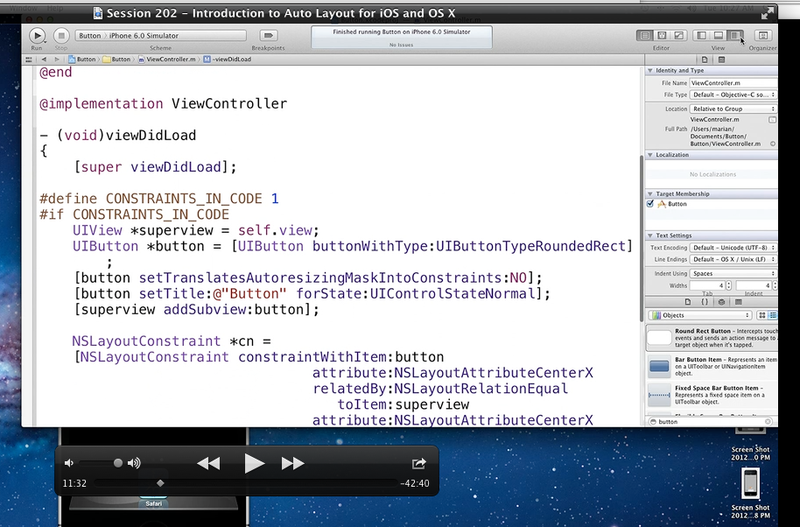 But if you come from OS X Cocoa development you would be used to making controllers from scratch. Back in the day a controller was usually just a subclass of NSObject. Don't forget this is still valid to do. 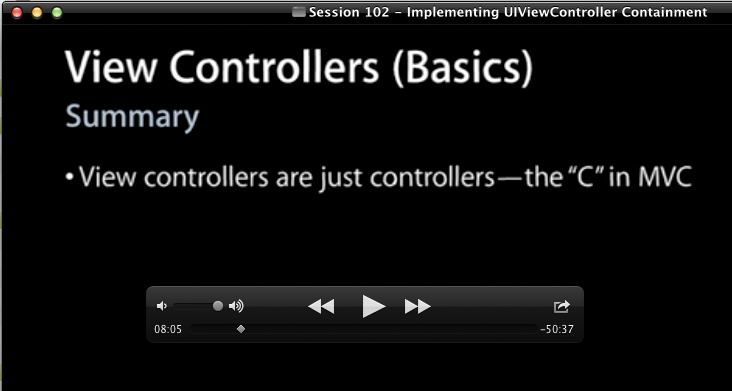 Not every controller needs to subclass some specific class like UIViewController. I see your point with the horrible Apple example code though. That is a pitty. I never thought of example code as something to look at for the purpose of good application architecture. The Apple documentation does in fact give quite good explanations for how to structure your application. But nowadays it seems people learns almost exclusively by example. I am not sure what the solution to this is. If example applications showed good software design that would increase the size and complexity of the example and take focus away from the specific API being taught. Perhaps Apple should have specific example programs just to show good Cocoa Software design. Totally agree with you, controllers are the glue and should now about the model and the UI so that UI can be reusable and model is reusable. The business logic should not go into the controllers of course. Business logic only deals with the model layer and should be hosted in a service layer. To sum up, the model contains the state, the service manipulates the model, and the controllers watch the model to propagate changes to the UI and listens to the UI to modify model state or call service methods. Can not agree more. Using tranditional MVC you can still create good architecture. The point is making viewcontroller small and simple. Experienced developers know how to separate functions into different models which could be viewcontrollers or regular controllers. We have lived with VC the monster for years. Would love an alternative suggestion. This is great stuff, Mike. Growing up as a developer through Smalltalk, all of this is part of my DNA, but I, too, have succumbed to Apple's pressures and muddied my code by bloating ViewControllers (I hate VCs... and don't even get me started on ModelControllers...). Reading this has reminded me of my roots and inspired me to refactor my current project, and for that I thank you. Keep posting in this series, please!! For those advocating the virtues of VCs, while I agree that we need to constantly be evolving as developers and scientists, this experiment has proven more disastrous than advantageous, as evidenced by the proliferation of outright bad codebases written by so-called experience OO developers, and the number of apps that crash and fail for, apparently, no reason whatever. MVC as a design archetype was created when things were much simpler (it was forged in the fire that gave us Smalltalk), admittedly, however, it has persisted for its simplicity, and most of the so-called enhancements or evolutions of it (MVVC, VCs, MCs, etc.) are nothing more (IMHO) than the hackings of folks who are not getting the essence and beauty of true MVC. As a technology consultant who has interviewed over 800 technology applicants I can attest to the sparse few who could articulate the actual responsibilities of the constituents of the MVC pattern, and many of these folks had Master's degrees from prestigious universities. The teachings now are based on faulty thinking and shallow understanding of OO fundamentals, as they have become dilute over the generations of developers such that the collective thinking is flawed at its heart, yet is propagated as correct and accepted. So, thank you Mike, for casting a harsh light on a dark shadow. Where is the continuation post, did you get a chance to write it? Great article, much appreciated as I thought I was just being mad. One concise question for people out there - IBOutlets and IBActions: I can wire them in to my view or my controller (or both). Logic says they should be in the view but then one must implement a protocol/delegate to interact with the controller/model. This seems like a lot of effort for nothing much. Alternative is wiring all the IBOutlets/IBActions into the viewcontroller which seems a problem if you need different views for iPad/iPhone ... thoughts/opinions? Hey, this is a good article you wrote there. Since I am one of these devs (1 year exp.) I am looking forward to reading your articles about solving these problems. But when will you write them? Mike! I really wanted to read the rest of the series you decided to begin a year ago (but didn't). I can glean your intent from reading the post, but it would have been cool to see where it actually leads. I'm guessing you'd replace all of the business logic common to View Controllers with bite size objects that can be unit tested? I have done this before when implementing UITableView Datasource protocols that started to get out of hand when everything was tossed into a single View Controller. Totally makes sense. Anyway, please post more articles. I want to see your unique solution to the problem. Thanks for this great article. I am very disappointed that you didn't make the next one with your solutions. I'd be glad to read it. Please finish the series! I was nodding the whole way through your post. I'd love to see the next one. It's never to late to resurrect the series! 2015 is here, and we're still waiting. Please teach us the right way! Hey! Couldn't you at least post a few more pics of kittens? Mike, all we are looking forward for you to continue! What's the alternative? It's easy to criticism. Nice post! Please keep working on new articles! This is awesome article. It made me actualize many past errors and i do still have some I'm working on to reduce. Definitely a wonderful article on why View Controller go beyond the point of frustration and you don't want to touch it again. 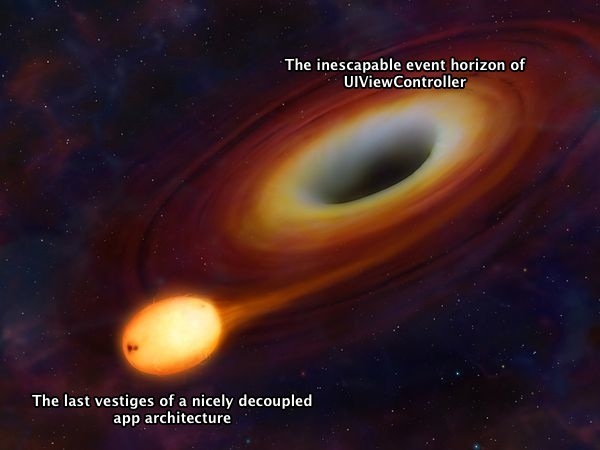 Excellent post by Mike on the problem with massive view controllers. I've studied different iOS architectures such as MVC, MVVM, ReactiveCocoa, for the last two years. I found Uncle Bob's Clean Architecture the best way to decouple classes and make your dependency graph very simple. I've organized our code into 3 main components - view controller, interactor, and presenter, and abstract away model data by creating request, response, and view model objects to pass through their boundaries. The result is amazing. With multiple developers on the project, we are able to know exactly which file and method to look when finding things. 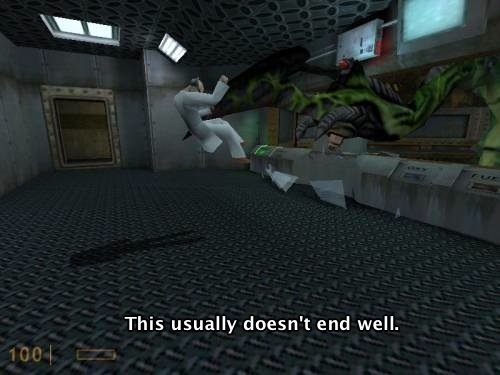 The other day, I had to fix a bug on a profile screen that was developed by another developer. I didn't write one line of this code but I know exactly where to find it. The methods are also very short as a result of apply Clean Architecture. I also added a router component to it and now we can use multiple storyboards with ease. This also allows us to write tests much easier as we only need to test methods at the boundaries. This is an excellent post. I am still holding out hope for a continuation. Thanks, hope you are doing well. I would love a follow-up post! 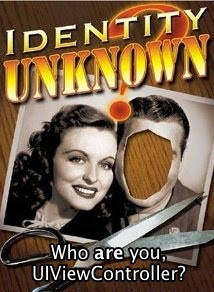 This was a great read. Though cool and hip, these cell phones are extremely sensitive. They have internal elements very delicate that a single drop might render the phone dead. So with this, having a cellular phone is synonymous to having cellphone cases. If you have your mind set on an iPhone app, then I urge you to also consider what happens when it is a success? Yes, I am assuming that your iPhone application will be a success because they are growing so rapidly. Thanks for the precious information. I m really grateful to you. Awesome post, I found this article very interesting check out my blog android app developers.